I never thought someone would want to know my skincare routine, but recently I’ve found both on social media and IRL that so many people want to know. It surprised me because I’ve never been someone that was blessed with waking up to great skin—until recently. 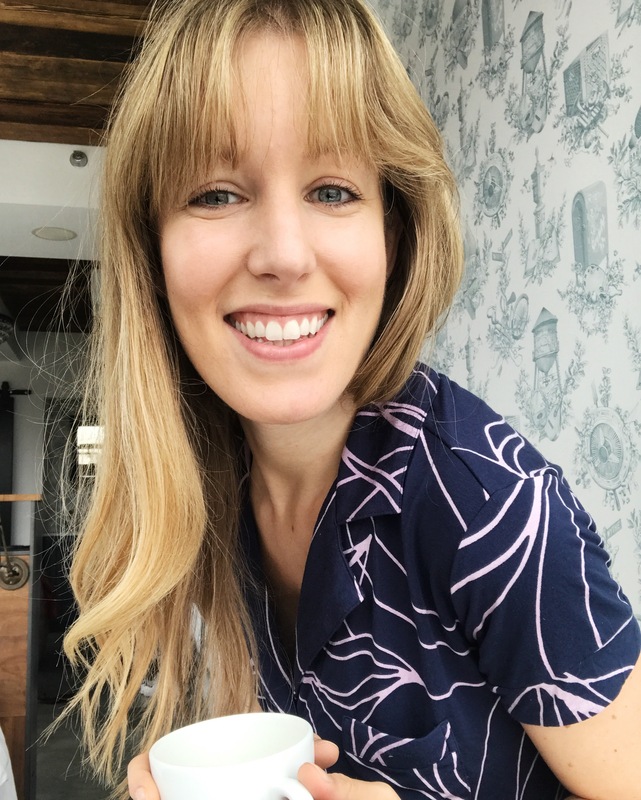 When I was in middle school I developed cystic acne on my forehead and battled that for years (every single topical and oral treatment you can name… and even getting bangs to cover it!). As an adult, I realized a lot of those breakouts were caused by nutrition (the hormones in cow’s milk). 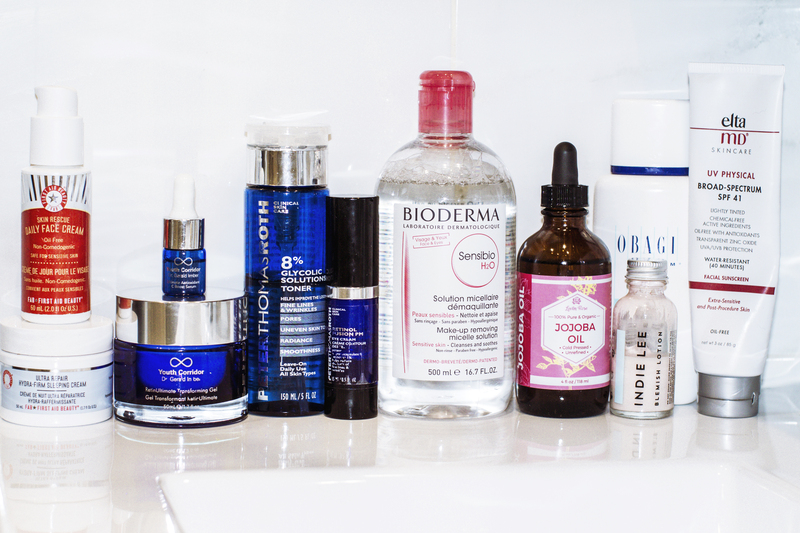 As much as that issue went away, my late twenties and early 30’s brought me different kinds of breakouts as if I were going through puberty all over again. I tried everything all over again down to changing what I ate, but everything seemed to aggravate it more. From blogging, I began to get sent tons of free beauty products that I tried at the same time out of desperation. I was gifted free facials and thousands of dollars in products, all of which made things worse. It got to the point where it was almost hopeless for me. I tried using nothing more than a gentle cleanser only once a day, a toner, and less makeup. Paring it totally back wasn’t the answer either. I still was battling the scarring and breakouts. Then, the magic of pregnancy hormones plus paring it back gave me glowy, clear, beautiful skin for the first time in years. I thought, this is it, I’m finally going to have great skin! 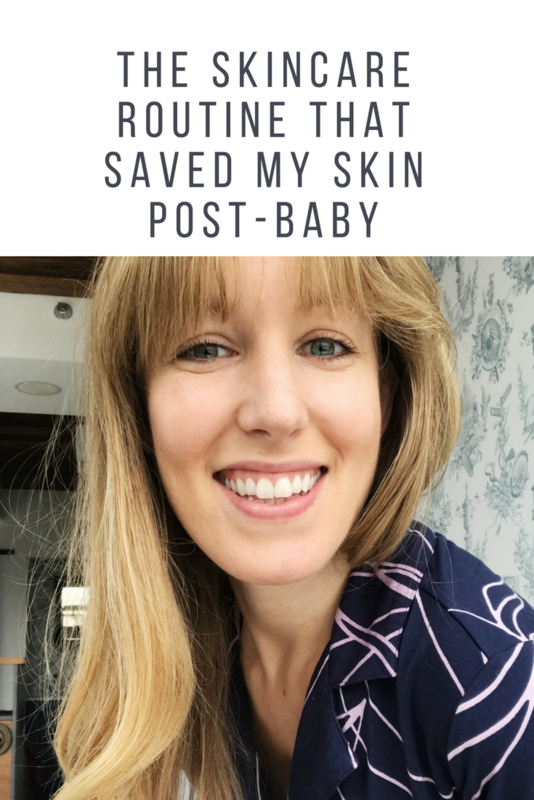 Then the baby was born and the postpartum hormones gave me the absolute worst skin of my life. I started to get pimples that look like they belonged on a teenager’s face and even began to have scars on my face from it. When I asked my dermatologist if there was anything I could do about it he said, “time” and a few rounds of painful/expensive laser treatments. It seemed even more hopeless to me. I resorted to even more makeup, which wasn’t helping the situation. 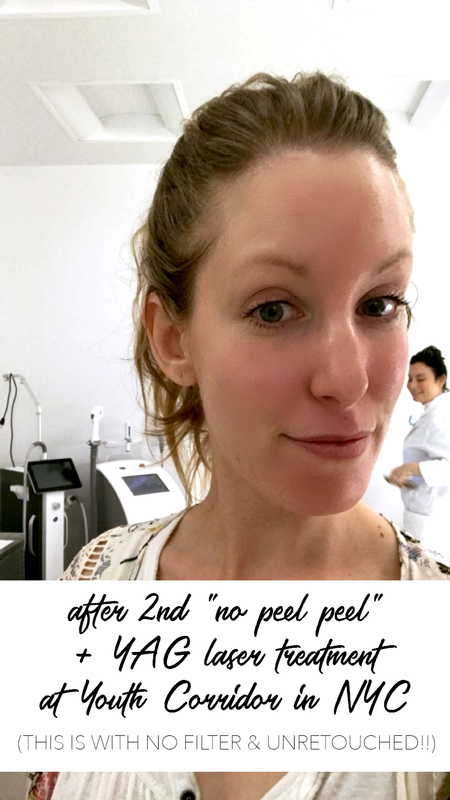 Fast forward to about a year postpartum when I was contacted by Youth Corridor Clinic on the Upper East Side of NYC to come in and try out their signature “No Peel Peel” treatment. 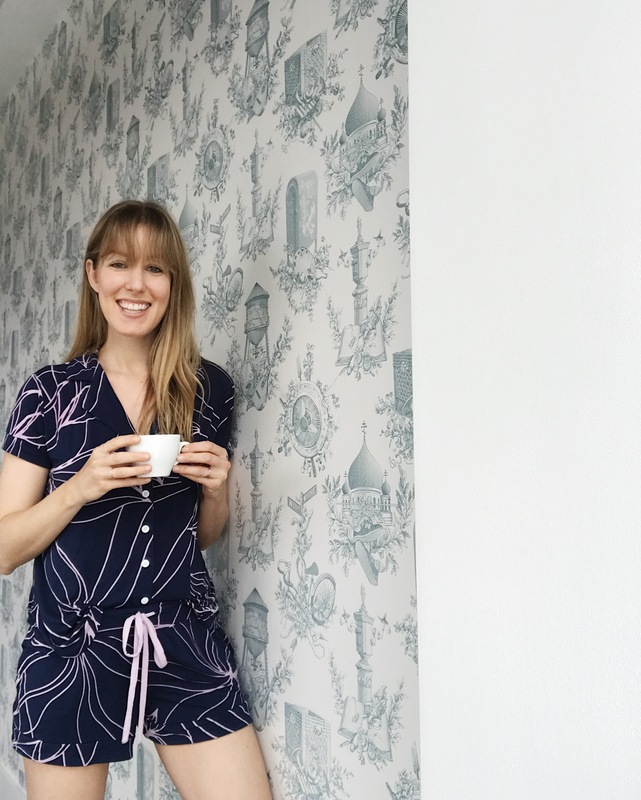 I vowed to refuse any skincare partnerships after my experiences but this was different; Youth Corridor a renowned plastic surgeon’s office that has a clinic in which an aesthetician personalized skincare treatments and a routine. They weren’t trying to just sell me products. They were trying to sell me great skin. I’m sold. After one visit with my esthetician, Denise, it changed EVERYTHING for me. 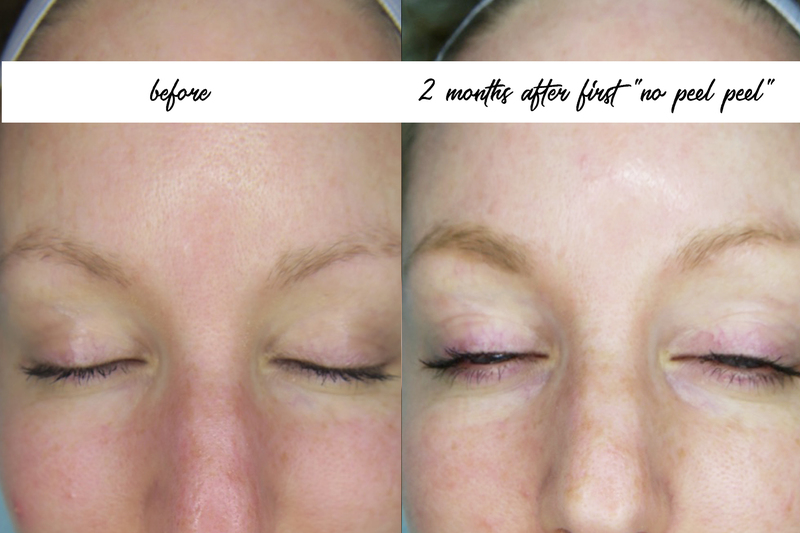 The “No Peel Peel” made me glow instantly and actually made my skin visibly smoother, but was completely quick and painless with zero downtime. First, she sat with me and reviewed my skincare routine. It turned out I was doing a lot of things in my routine and lifestyle right like some of the products I was already using and how conscious I am about nutrition, but there were a few things that were wrong that she pinpointed and it helped. I should be cleansing more. I was only cleansing at night and just splashing water on my face in the morning because a makeup artist once told me that helps with oily skin prone to breakouts. Denise told me if anything I should be cleansing more! In fact, I should be using a gentle cleanser and doing it twice in a row! I’m really focusing on getting all of the makeup off my face at the end of the day now. I need to exfoliate more. Part of why my breakouts were occurring was because I needed to get rid of the dead skin and control the oil with exfoliating. To me exfoliating sounded scary and irritating. I’m kind of right because she said scrubs are a no-no and can make things worse. She recommended using glycolic acid in my routine to gently exfoliate daily. There’s a more effective order to applying products (see below). I was doing it all wrong! How if you don’t want to use many products in your routine, at least include Vitamins A, C and E.
These are the most important things because they battle wrinkles, acne, scarring and help keep everything moisturized. That there was still hope for beautiful skin. It would happen sooner than I thought and it would be painless! On my second visit with Denise at Youth Corridor, I received another “No Peel Peel” and a YAG laser treatment. I had laser treatment in the past and it was incredibly painful and the downtime was unbearable. Denise warned me that I would like this treatment TOO much that I’d keep asking for it. I think she’s right. It felt like heat on my face but with zero pain and as you can see from above, I walked outside without looking like I had something done. It looked like I just had a real life Instagram filter, instantly shrinking my pores and erasing some of my scaring. These treatments combined with my new routine have really made a difference. One of the things I appreciated the most about Youth Corridor was that they tailored my skincare to my own skin, but didn’t try to sell me on all of their products—just the ones that were essential to my routine and made the biggest impact. Cleanse – the esthetician recommended this gentle cleanser from Obagi that’s been great. I also use this Peter Thomas Roth cleanser when I travel and LOVE it). Do this 2x with lukewarm water and then gently blot with a soft towl, don’t rub skin dry. Eye Cream. (Always apply your eye products before face products.) I’ve loved this eye cream from Peter Thomas Roth with retinol for years and was hooked on this Aveda one that I used during my pregnancy and while breastfeeding. Moisturizer – Using my current moisturizer, which is a light one from First Aid Beauty. Makeup and an SPF 30 – I mix Jojoba oil in with my tinted SPF for extra glow and balancing out my oily skin. Remove your makeup and sunscreen – do this thoroughly with a gentle cleanser. I remove excess eye makeup with jojoba oil after this step. Cleanse again with the same cleanser, prepping your skin for the next step. Blot skin dry. I use Micellar Water instead on days I feel like my skin is dry. This micellar water from Bioderma was recommended by a few Parisians last time I was in France. Exfoliate – scrubs are way too harsh, especially daily. Saturate a flat 100% cotton pad with Peter Thomas Roth 8% Glycolic Toner and apply to face in one direction and two passes. (You can technically do this in your morning OR your evening regimen before you apply any active products to your skin… I choose to do it at night). Eye Cream – (Always apply eye product before face products). Retinol – RetinUltimate Transforming Gel is worth every penny. It has never irritated my skin and makes a huge difference in acne and wrinkles. You shouldn’t apply moisturizer or any other product over retinol or else it makes it less effective so I actually stopped using night cream and the oil in the morning balances it out. We’ll see how my skin reacts in the winter, but so far it’s been perfectly balanced and never dry with this routine! If I get a pesky zit, I apply Indie Lee Blemish Lotion, which dries it out almost overnight. I also did a ton of research myself and came to find that Jojoba Oil is a game changer. It’s considered an effective acne treatment because jojoba oil signals your skin to balance itself out and it mimics your own sebum. I like this organic one jojoba oil from Leven Rose. If my skin freaks out (that time of the month especially), I calm it with a Manuka Honey face mask. I break out from everything so trust me, it’s totally safe to smear over your sensitive skin. Manuka honey is known to be highly anti-bacterial so it’s no wonder why it works. Look for a high MGO rating and that it’s pure Manuka. I’ve been happy with this Manuka honey and it’s worth the price tag—I take a spoonful when I feel like I’m getting sick and it helps that too! Now I actually wake up with skin for the first time in my life that I don’t feel like I have to run and put makeup on. * I’m so grateful that I connected with Youth Corridor and have really learned so much more about skincare in just two sessions with them. I thought I knew so much just by working with makeup artists regularly, but good skin is a totally different thing than making someone just look like they have good skin. My skin is not perfect (yet) but it’s starting to get there. I’ll keep you guys posted on my quest for it and please keep your skincare/beauty questions coming! *yes, I totally woke up before everyone else on vacations with friends and put on makeup to cover my acne/scars. I was that girl. Please note that other than subtle filters, there is NO retouching on any of these images of my skin! Thank you to Youth Corridor for partnering with me on this post. What I chose to write about and review, as well as all opinions are 100% my own. If you’d like to make an appointment with Youth Corridor, you can contact lindsay@drimber.com.